When you use the Metro, pay attention and perhaps you’ll see an operator standing on the platform’s yellow stripe, waving red flags. He might go unnoticed in the crowd, but he’s a manual controller and he uses the flags to authorize the upcoming train to enter the station. If you see him, it means that there’s no communication between the trains and the operations center. The trains lower the speed to 15 km/h in those cases, a common occurance now. There was a culture of care thanks to user education. Using the subway could save people over 40 minutes in traffic on the streets above. In 1983, the Metro was planned to transport 700,000 passengers. Now, it transports 2,500,000 people, half of Caracas’ population. Being that overcrowded has degraded the service, maintenance isn’t a priority and whatever funds the company earns is used for the payroll, 10,000 employees whose base salary falls below Bs. 400,000 a month (some $1.76 at the current black market rate). Metro de Caracas is a company subsidized by the government. The price of the tickets (Bs. 4 for a one-way ticket, 0.000017 cents of a dollar) isn’t enough to cover the payroll or to pay providers. A train that covers 185,000 km per year requires an exhaustive maintenance plan, but we officially don’t know how much the government has invested on the system. 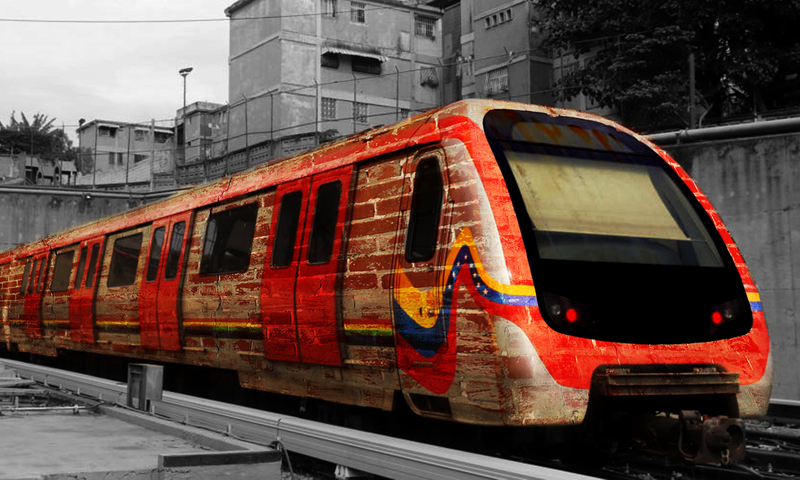 In 2017, President Nicolás Maduro approved three million dollars to “invest them on improving the operational capacity of trains, railways, power distribution, stations, revenues, spare parts and cleaning” while Metro chairman César Ramón Vega González said that there was a project presented by the employees themselves to acquire 169 escalators for 2018. However, 300 of the system’s 376 escalators are out of order for lack of parts. They don’t even cannibalize dismantled escalators anymore, they don’t have parts either. Many operator booths have no employees in them and several stations don’t have tickets due to a debt with Alcatel, the company that makes the rolls to print them, so the service is now practically free. In dirty platforms and train cars without air conditioning, people get drunk, pee, sell trinkets or beg just like in the the city above it. Between November and December 2017, the government merely launched two plans to “embellish” the stations, as they’ve done in streets and squares. They painted ceilings, walls and railings; they cleaned the green areas and placed new light bulbs. The company’s employees were forced to work on that for free. In late January 2018, a security plan was implemented in all 48 stations, since they didn’t have either operators or guards. The plan was unsuccessful and the Metro is just as unsafe as the surface. There have even been incidents that the government calls acts of terrorism: four tear-gas canisters in stations and a suitcase allegedly containing an explosive device. Fear reigns. The employees are at the mercy of an union, Sitrameca, chaired by Edison Alvarado (close to Maduro) who’s accused of ruling as a tyrant and ban criticism. Alvarado’s sister heads the Human Resources department and one of his brothers heads the Finance department. When it opened to the public, the Metro de Caracas system represented the largest engineering and technology achievement for the country in terms of transport infrastructure. It required an initial investment of two million dollars with French technology from Alstom, which was later joined by the contribution of Spain’s Andean Development Bank (CAF). Little of that remains. In dirty platforms and train cars without air conditioning, people get drunk, pee, sell trinkets or beg just like in the the city above it. Additionally, everything can shut down at any moment due to power outages; the Metro is the reflection of a collapsed country. With all the serious failures in public services, caraqueños, regardless of whether they have money or not, get up every day without knowing what they’ll find on the streets… or below them.